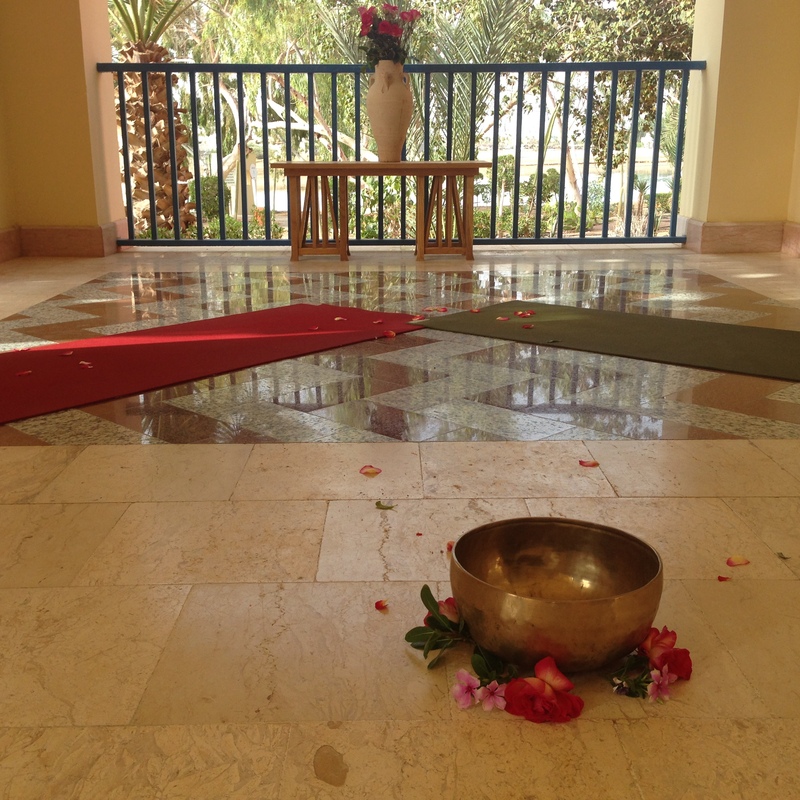 So many inspiring lessons from the Nun Center Yoga and Detox Retreat at Soma Bay. One afternoon meditation we took the class to the great outdoors, meeting on the beach before sunset for a walking meditation. 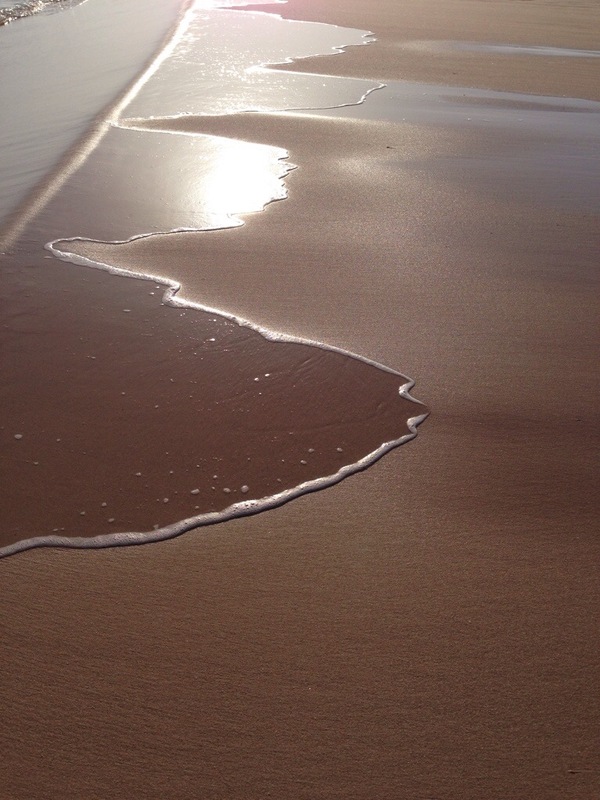 There, each participant walked quietly, with presence and awareness, each taking their own time to feel each barefoot step on the sand as the Red Sea lapped at the shore, meeting at one spot where the sun ducked behind the mountain ranges. With little instruction other than to breathe, to feel their feet and be in the present moment, each person set off on their own small journey. Each experience was different from the another, but what was clear was how nature became their teacher that afternoon. How the sand, the water, the epic far off mountain ranges, the air and the sun took part in a range of subtle and spectacular lessons. How when we relax into nature, it holds us, and leads the way. 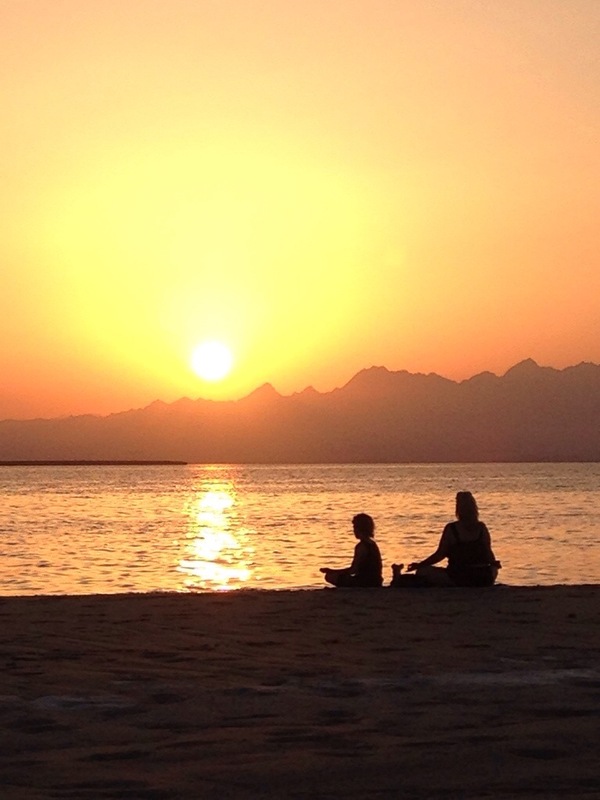 PHOTO: Retreat participant Amber and her son Jonas watching the sunset at the end of our walking meditation. It’s interesting how when on long retreats or long periods of intense practice inevitably the dark shadows come. rather how in all the brightness and illumination, we see more clearly the shadow self: the dark egoistic tendencies, our repeating issues and patterns, old but not so forgotten sadnesses and bad feelings. Not that we are meant to dwell on these things, but rather as we see them for what they are, we become less scared or intimidated or bothered by them. It is only a shadow after all. And there, we are able to move on. Coming to the end of this week long yoga and detox retreat with Nun Center here at Soma, I’m reminded of how seeing these dark versions of ourselves are really gifts of light and vision. That clarity in the heart and mind comes from really truly deeply seeing. In my way, I am excited by all the shadows that surfaced and by the courage and openness and exploration such shadows inspired in our wonderful group here. Everything is a gift. We simply must be open enough to receive it. 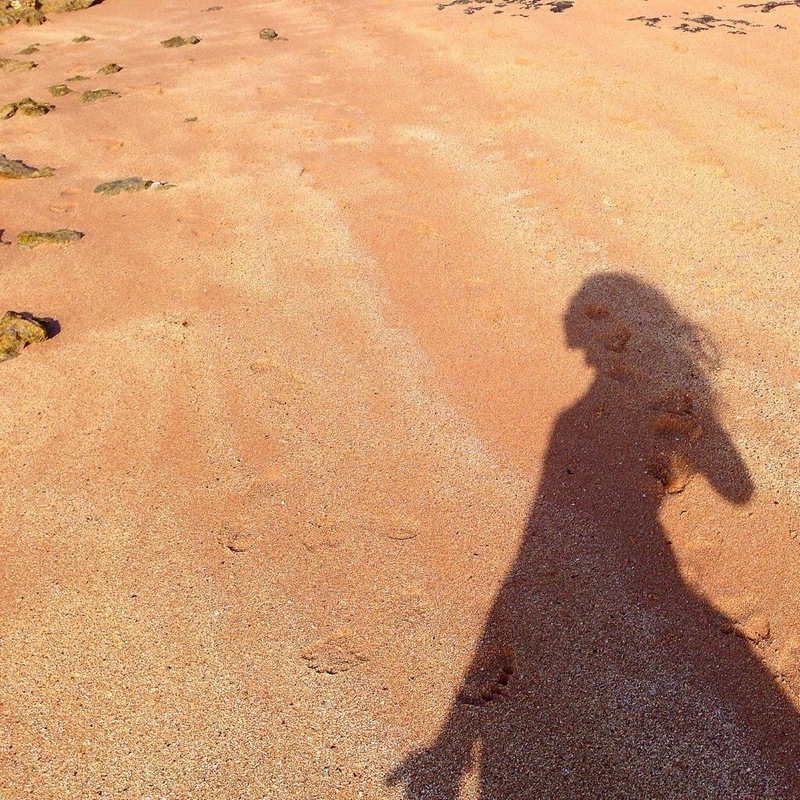 PHOTO: My own shadow on the beach here at Soma Bay, Egypt, which has been a lovely setting for a retreat. For nearly a week, three times a day, I’ve been meeting with our Yoga and Detox group here at The Thalasso Spa Soma Bay yoga room, unimpressively called Gym 2. 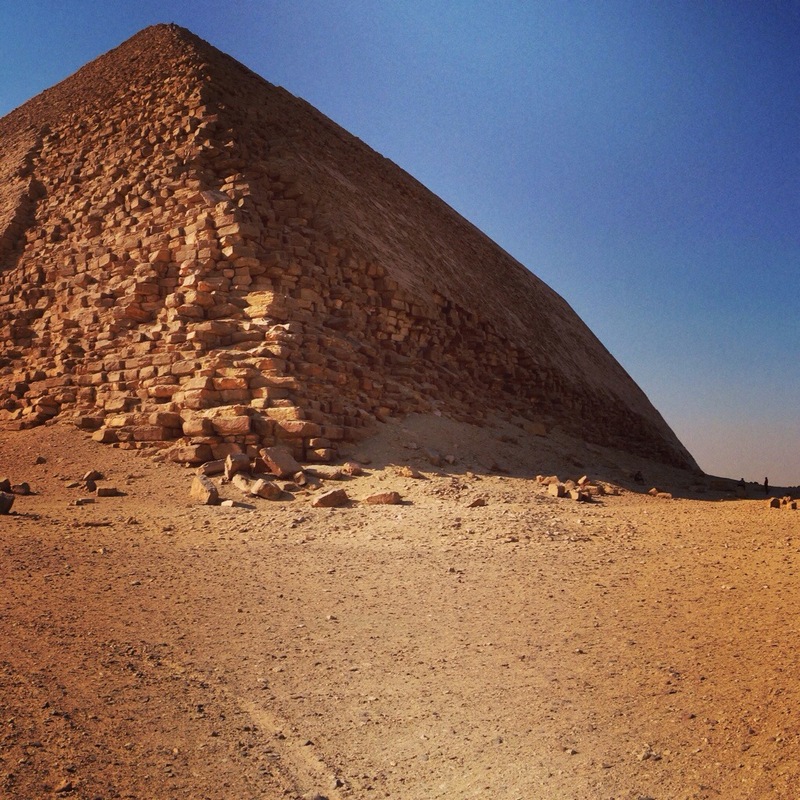 From day 1, we’ve been building something, though at the start, well, it seemed indistinguishable. Bits and pieces if this thing we call yoga. Shapes and forms with the body. Sanskrit Mantras. Breathing techniques. Meditation. And with our group of mostly beginners, some entering the retreat midstream, even I wondered at the mysterious structure, I wondered how the yoga portion of the retreat would take form. Now, nearing the end, I see that we have been building a bridge. 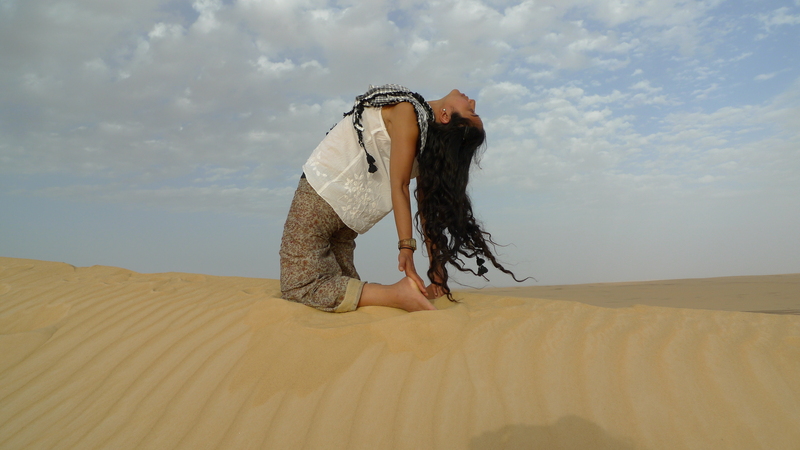 That in this setting of detox, of clearing the body and mind and emotions, of letting go, the yoga practice has been about building a bridge between one way of seeing, living and being to another more wholistic approach. We are between two varying paths. Yoga is a bridge. And I’m looking forward to seeing myself and this group on the other side. 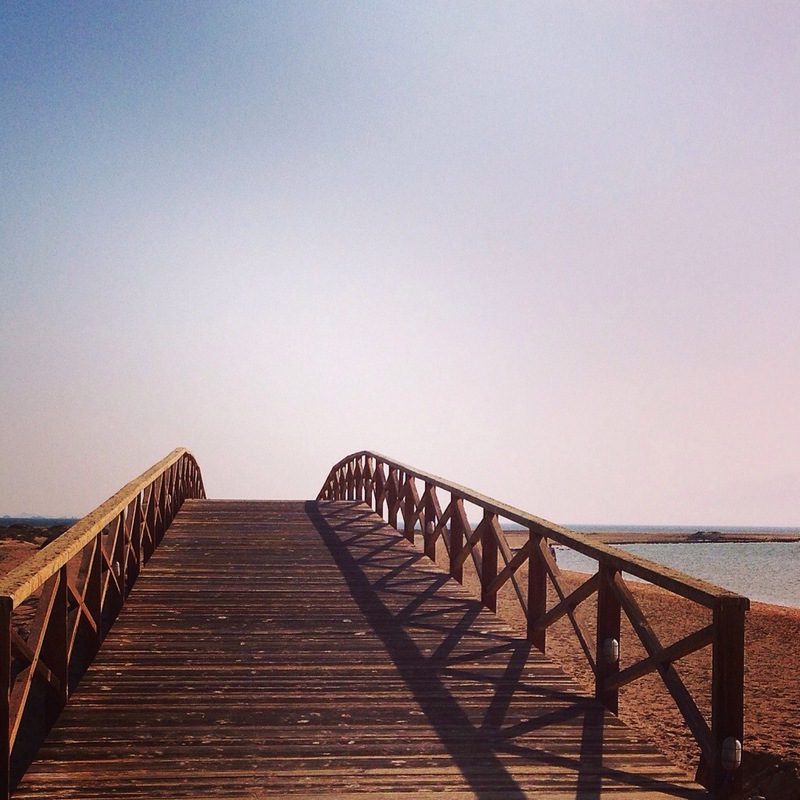 PHOTO: Bridge at Soma Bay. Excited to lead the group over this bridge later on our afternoon walking meditation. Though the retreat is soon coming to an end, I know that whatever has started here will continue to move people forward. Happy to also know I will continue to have contact through classes as NUN Center this month and an Ashtanga and Inner Dance Workshop there at the end of the month. It’s going to be great!